Specializing in Air Conditioning, Heating, Ventilation, and Refrigeration Systems. 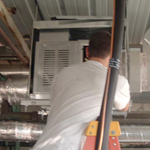 Smith Heating & Air Conditioning, Inc. provides top quality installation, service and repair of residential, commercial, and industrial HVAC systems. 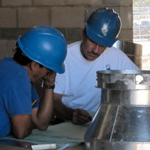 We offer residential, commercial, and industrial HVAC design, installation, maintenance and repair, turnkey equipment retrofits, HVAC controls, automation, and more. Since 1972, we have been committed to unsurpassed customer service. 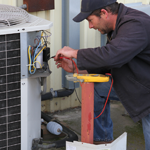 If you find that your air conditioning system has broken down completely or not cooling you home as it should, you need a air conditioning repair specialist who will be there quickly to perform any necessary repairs. Our highly trained air conditioning technicians are available for 24/7 emergency AC repair service to assess and resolve any problems you might have with your system. Smith Heating and Air Conditioning has 42 years of experience with air conditioning installation. If you think it might be time to replace your old air conditioning system, call Smith Heating and Air Conditioning to discuss your options. Installing a high–efficiency unit might be a more cost effective alternative to paying for air conditioning repair service several times throughout the year; however, it’s always good to speak with a professional air conditioning specialist who can help you make a decision. Feel free to contact us any time if you have questions about air conditioning installation. A zone control system allows you to divide your home into different areas with individual climate controls. This is not only convenient, but it can also save you money. Our expert zone control installers will be able to evaluate your home’s system to determine where zone controls will serve you best, and then integrate them into your existing system. Zone control systems can also be integrated into forced air systems. 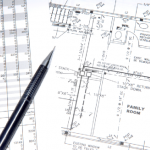 Every home is different, and we will make sure to offer suggestions and recommendations to fit your unique needs. Carrier: You won’t be sorry you’ve chosen a Carrier Air Conditioning System. They have a reputation for being very efficient and can provide years of optimal cooling and heating. Contact us today if you’re in need of Carrier Air Conditioner Repair in Stockton, CA and surrounding areas. Lennox: Lennox AC units fall under our area of expertise. 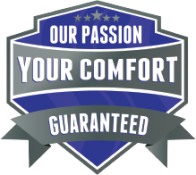 We have been servicing Lennox Air Conditioners for years and we know them inside and out. If you’re in need of Lennox AC unit repair, contact us today and we’ll get your home or office back in working condition in no time. York: Repairing York Air Conditioners in Stockton, CA and surrounding areas is not a problem for us. For the intense California summers, a York air conditioning unit can be a great choice. If you’re in need of a repair, a check-up or an installation, call us today and we’ll help you be surrounded by cold air all summer long! Goodman: Is your Goodman Air Conditioning Unit not blowing cold air or in need of a tune-up? We are qualified to service Goodman units and can run a full diagnosis and consult you on all your options when it comes to Goodman Air Conditioner Repair in Stockton, CA and surrounding areas. Choose the best Goodman AC Company in Stockton, CA and surrounding areas. Rheem: We are the premier Rheem air conditioning repair company in Stockton, CA and surrounding areas and have been for years. If you own a Rheem AC unit and are in need of repair or an estimate, contact Howard Air today for any service, installation or repair needs.